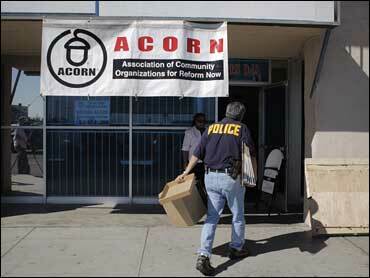 ACORN Controversy: Fraud, Or Foolishness? The stories are almost comical: Mickey Mouse and Donald Duck, registered to vote on Nov. 4. The entire starting lineup of the Dallas Cowboys football team, signed up to go the polls - in Nevada. But no one in either presidential campaign is laughing. Not publicly, anyway. Republicans, led by John McCain, are alleging widespread voter fraud. The Democrats and Barack Obama say the controversy is preposterous and is just political mudslinging. In the middle is the Association of Community Organizations for Reform Now, known as ACORN, a grass-roots community group that has led liberal causes since it formed in 1970. This year, ACORN hired more than 13,000 part-time workers and sent them out in 21 states to sign up voters in minority and poor neighborhoods. They submitted 1.3 million registration cards to local election officials. Along the way, bogus ones appeared - signed in the names of cartoon characters, professional football players and scores of others bearing the same handwriting. And in the past few days, those phony registrations have exploded into Republican condemnations of far-ranging misconduct, and a relatively obscure community activist group took a starring role, right behind Joe the Plumber, in the final presidential debate. Is ACORN, according to McCain, perpetuating voter fraud that could be "destroying the fabric of democracy"? Or are Republicans trying to keep the disadvantaged, who tend to be Democrats, from casting ballots in a hotly contested presidential race that has drawn record numbers of new voters? By legal definition, to commit voter fraud means a person would have to present some kind of documentation at the polls - a driver's license, a phone bill or another form of ID - that bears the name of Mickey Mouse, for example. To do so risks a fine and imprisonment under state laws. Accusations of stolen votes have a long history in presidential elections. In the 2000 recount debacle, Republicans claimed illegal ballots were cast. Democrats contended that legal ballots were thrown out. In 2004, when Ohio gave the presidency to George W. Bush, Democrats charged that long lines and malfunctioning machines in that state led to an inaccurate count. But in this contest, involving the first African-American in American history with a real chance at becoming president, the vitriol is particularly pointed. "This is all just one big head-fake," said Tova Wang of the government watchdog group Common Cause. "What silliness this is, at this point. It's all about creating this perception that there is a tremendous problem with voter fraud in this country, and it's not true." On Friday, during a campaign appearance, Republican vice presidential candidate Sarah Palin repeated McCain's recent claims that Obama has close ties to ACORN. "You deserve to know," Palin told thousands in a park north of Cincinnati. "This group needs to learn that you here in Ohio won't let them turn the Buckeye State into the Acorn State." Obama helped represent ACORN in a successful 1995 suit against the state of Illinois, which forced enactment of the so-called motor-voter law, making it easier for people to register vote. Obama said this week that he had "nothing to do with" ACORN's massive voter registration drive. ACORN spokesman Brian Kettenring retaliated this week in a series of conference calls and interviews. "What we're seeing is the manufacture of a crisis, and attempts to smear Sen. Obama with it. It gives you an excuse should you lose or if there's a contested outcome of the election." Voter fraud is rare in the United States, according to a 2007 report by the nonpartisan Brennan Center for Justice at the New York University School of Law. Based on reviews of voter fraud claims at the federal and state level, the center's report asserted most problems were caused by things like technological glitches, clerical errors or mistakes made by voters and by election officials. "It is more likely that an individual will be struck by lightning than he will impersonate another voter at the polls," the report said. Alex Keyssar, a professor at Harvard's Kennedy School of Government, calls the current controversy "chapter 22 in a drama that's been going on awhile. The pattern is that nothing much ever comes from this. There have been no known cases of people voting fraudulently." "What we've seen," Keyssar said, "is sloppiness and someone's idea of a stupid joke, like registering as Donald Duck." ACORN officials have repeatedly claimed that their own quality control workers were the first to discover problematic ballots. In every state investigating bad registrations, ACORN tipped off local officials to bogus or incomplete cards, spokesman Kettenring said. Many states require that all registrations be submitted to local voting officials so that election directors are in charge of vetting problem ballots, not the groups collecting them. Part-time ACORN workers receive one day of training and are paid $8 an hour to collect signatures, according to Kettenring. He blamed bogus cards on cheating and lazy employees trying to make a buck for doing nothing. When caught, Kettenring said, those workers are fired. The group is in the process of tallying the number of bad cards ACORN flagged for election officials, he said. Kettenring said he doubted the percentage of such registrations would reach 2 percent. But Republicans say any number of fake registrations is unacceptable and could affect the November election. Signing up voters is a small part of ACORN activities. The group frequently leads challenges to minimum wage laws, predatory mortgage lending in poor and working-class neighborhoods and immigration policies. Controversy is nothing new. Its leaders are currently locked in a legal dispute stemming from allegations that the brother of the group's founder misappropriated nearly $1 million of the nonprofit's money several years ago. Since the 2004 election, ex-employees have been convicted of submitting false registrations in states including Florida and Missouri. "There are certainly problems and I don't think anyone disagrees on that," said Wang of Common Cause. "But it doesn't get reported that ACORN finds these registrations errors themselves. They flag them as being no good, but they have to turn them in anyway." "They don't get processed," she said. "And Mickey Mouse is not going to vote."